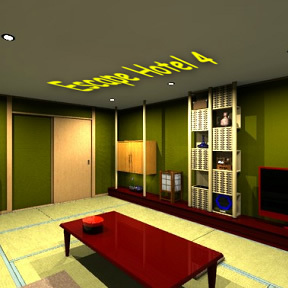 A few weeks back the popular Japanese room escape designer Tesshi-e took us back to the Escape Hotel, that wacky vacation spot that caters to the needs of those who feel the need to logic their way out a locked room, any locked room, at least once a week. But reasoning your way to your hotel room isn't really an escape, is it? It felt more like an appetizer, enough to whet the appetite but leaving one longing for more. Where, the reader may ask, is the really fun bit, where you get locked into your hotel room and can't get out? Fortunately, Tesshi-e has provided that more with a beefy main course of The Escape Hotel 4. Now this is proper room escaping! Like its predecessor The Escape Hotel 3, Escape Hotel 4 is one of Tesshi-e's better efforts as it involves a wacky vacation paradise that consists of lots of logic, math, color puzzles, and the frustrations of being locked in by mischievous staff. Escape Hotel 4 leaves off most of the construction and concentrates on good old logic to find your way to dinner or, if you're lucky and can find the lucky coin alternate escape, something even more relaxing. Included are all the bells and whistles common in any Tesshi-e escape: tight controls, logical progression, easy inventory, the ability to switch languages and save your efforts, and the ever-present wobbly picture puzzle. Yes, that thing is back again, some more. Regular Tesshi-e fans might be surprised by this one as the gamer faces a lot less construction and a lot more logic, especially math. The room itself is a lovely, tranquil, traditional Japanese-style space that is so soothing the player might be tempted to just hang around a while. Fortunately the familiar music will soon motivate to get the heck out of dodge, if only to flee before that particular tune becomes permanently imbedded in the psyche. There's very little to complain about with Escape Hotel 4: the puzzles are logical and flow, the navigation is pretty intuitive (except in some hidden spaces), the translations are excellent, and the pixel hunting is at a minimum. The puzzles do seem to rely a bit more heavily on color than is usual, and for those of the "math is hard" school, well, the puzzles might be a little more difficult. Otherwise, this is Tesshi-e room escaping at its finest, a satisfying and filling mid-week break from the everyday. Oh, if only a hotel like this existed in real life! The Escape Hotel 4 Walkthrough now available! Be prepared for a lot of math. Close observation is the key. Don't forget to change the game's language before you start. There is a happy coin alternate escape as usual. Don't forget to examine the objects you pick up, they may be hiding something. You begin facing large white rice paper sliding screen doors which, of course, do not open. If you click on the base of the doors you will see that they are secured with a stick and screws. Notice that there's something already in your inventory, your room key with the room number 2514 on it. You are now facing a wall with two pictures on it. You can also see an electric kettle on a low table against the wall and a round box of some sort on the main table in the middle of the room. Click on the kettle for a close up. If you click on the top of the kettle you will find that it is empty. There is also an electrical socket on the wall nearby. Back up. Click on the left picture for a close up. Lovely trees. There is also an interesting clue in the corner of the picture, a flag and the number 7152. Back up and click on the right picture for a close up. Ah, a picture of Mt. Fuji. If you click on the corners of the picture you will notice they move. Gee, what a surprise, a wobbly picture puzzle. Back up. Click on the box on the table for a close up. Click on the lid of the box to remove it to find a tea set. Notice something in the cup? Yes, it's a spade key! Take the key. Click on the lid to turn it over. Another clue! This one is a smiley face and the number 5418. You are now facing a wall with a wood door. Yep, it's locked as well. To the left of the door is a low wooden screen, click on it for a close up. On the screen you will see yet another clue, a Maltese cross with the number 3891. There's lots to see on this wall, including a large flat-screen TV. To the left are some wooden cabinets, click on them for a close up. Looks like the doors are wired shut. Back up. Click on the planter below the cabinet doors to see a pretty flower and another clue, a star of David and the number 9564. Just to the right of the cabinet is a small screen lantern, click on it for a close up. Click on the lantern screen to open it. Inside is a candle holder without a candle and another clue, a sickle moon/star symbol and the number 5274. Back up. Between the lantern and the TV is a tall shelving unit, click on the bottom shelf for a close up. On the bottom shelf is a hexagon shaped machine with a button. Push the button and numbers appear. Hmmm, is there something wrong with that sequence? Back up and click on the next shelf up which contains a book. Click on the book to open it. Hmmm, more clues involving symbols. The first is a smiley face, a flag, and a Maltese cross which apparently equal 5487. The second clue is a flag, a star of David, and a sickle moon, and this one apparently equals 7330. Back up twice and click on the next shelf up. There's a machine here with a four digit code and three symbols on it, a smiley face, a Maltese cross, and a sickle moon. Back up and click on the upper part of the shelving unit. Here are two vases and, on the very top shelf, a box that you cannot reach. Back up. You can click on the TV for a close up, but without the remote there's nothing you can do with it. Turn right and you are facing the white sliding doors again. Turn left to face the TV wall, then click on the third shelf up, the one with the machine with the four digit code. Note the symbols above the code key, the smiley face, Maltese cross, and sickle moon. Apparently these three symbols have something to do with the code. We've seen these symbols around the room, with four digit numbers as well. We've also seen these symbols in the book on the second shelf. Maybe that's a clue? The clue is in the book. A smiley face, a flag, and a Maltese cross equal 5487. That's not a sum of the numbers attached to those symbols, though. What it is is an average of the three numbers. The smiley face is 5418, the flag is 7152, and the Maltese cross is 3891. Add them together and you get 16,461. Divide 16,461 by three and you get 5487, which is in the book. Therefore to solve the three symbol code on the machine, you need to get the average for those three symbols. The code on the machine is a smiley face, a Maltese cross, and a sickle moon. The smiley face is 5418, the Maltese cross is 3891, and the crescent moon is 5274. Add those three numbers together to get 14,583, then divide that by 3 to get 4861. Therefore the code is 4861. Put the code in the machine and click the slot above the code key to unlock the little drawer. Congratulations, you've found a screwdriver! Take the screwdriver and back up twice. Turn right to face the white screen doors. Click on the base of the doors to see the piece of wood and screws. Use the screwdriver to remove the wood. You now have a long stick of wood and the door is open! Click on the open screen doorway for a close up. Inside you see two lovely couches on opposite sides of a glass coffee table. There's some sort of mechanism on the table against the wall. Look to the right and you can see some sort of shelf. There's something in the ashtray on the table, take it (matches). Click on the machine on the table for a close up. Hmmm, this little machine has a gold ball in it, but we can't reach it. It also has the words "Hot Water" on it, as well as a small slot and a four digit code. Looks like we need to find some hot water. Back up. Click on the right side of the room to get a close up of that shelf. Yep, a shelving unit with two drawers, and a red hexagon object on top. Click on the red hexagon for a close up. Back up once, then click on the drawers for a close up. Open the right drawer to get the TV remote. The left drawer is locked. Wonder if the spade key will work? Yes, it does. Use the spade key to open the drawer and get a power cord. Back up twice, then click on the left side of the room (inside the doorway, above the left couch) to see what's on that side. Looks like a refrigerator with another hexagon, this one in green, on top. Click on the green hexagon for a close up. Another sequence of numbers when you push the button, another minor problem with the sequence. Wonder what that's all about? Back up once, then click on the refrigerator door for a close up. Looks like we need a three digit code here, and the code key has colored hexagon shapes, blue, red, and green. Perhaps the three hexagon shapes in the code key (blue, red, and green) correspond somehow to the larger number machines in the room? As you clicked through the number sequences on the machines (blue on the shelving unit by the TV, green on the alcove shelf, green on top of the refrigerator) did you notice anything funny about the numbers? As you click through the numbers 0 through 9, one number on each machine is missing from the sequence. The blue hexagon sequence is missing a 7, the red hexagon is missing a 5, and the green is missing an 8. Since this is the order of the hexagons on the refrigerator code key, then the clue is 758. Click on the code key on the refrigerator door (if you aren't already) and enter the three digit code. Open the refrigerator and take the bottle of water. Now we're cooking with gas! Back up three times to the main room. Turn right to face the wall with the pictures. Click on top of the kettle to open it, then use the bottle of water to fill it up. Use the electrical cord on the socket to plug in the kettle. It will take some time for the kettle to boil, so back up and wander around the room. Click on the kettle for a close up again. Take the kettle of hot water and back up. Turn left to face the open screen doors. Click on the alcove for a close up, then click on the machine on the coffee table for a close up. Use the kettle of hot water on the machine. Several things happen. The gold ball will float to the top where you can take it, the lettering will change to "DRIB", and the code lock will activate. Looks like we need a four digit code. Take the ball and back up twice to the main room. Turn left to face the wall with the television. Click on the television for a close up. Notice that the remote now appears on the screen to your left. Click on the green on button to turn on the TV. Okay, that bird figurine looks very familiar. You also see the word "BIRD" and the number 5163. Click on the 2 button on the remote to change the channel. This shows a live streaming view of the other side of the wooden door. Note the handle on the door. Click on the 3 button to change the channel again. This time we have a colored test pattern with a star and an arrow superimposed on top. The arrow runs from left to right, and the colors from left to right are: blue, green, green, red, green, red, yellow. The rest of the channels show nothing but snow, so back up. Turn right to face the alcove, then click on the coffee table twice to go back to the machine that had the gold ball. Now we need to figure out the four digit code for the machine. The clue was on channel 1 of the TV. The clue was the word "BIRD" and the number 5163. Notice on the machine the word "DRIB" which is "BIRD" backwards. Therefore, you should reverse the number from the TV clue, to make it 3615. Enter the code into the machine and something will come out of the small slot. Take the object (metal strip) and back up twice to the main room. Turn right (or left) twice to face the wooden door. Remember, we saw a camera feed of the other side of this door. The door has a handle rather than a knob. Perhaps if we had something long and thin to slide in the side, we could jimmy the handle. Maybe the strip of iron we just picked up? Use the iron strip on the door (on the right, where the handle would be) to open it. Click on the open doorway where you just opened the wooden door. Nope, it's not the way out, just the bathroom. Bummer. In front of you is a four door sliding door. But of course, it's locked. You are now facing the vanity and sink, with another door to your left. Yes, it's locked as well. Hmmm, not really a lock, looks more like a screw holding the doorknob. Of course, the screwdriver doesn't work on it. Click on the sink for a close up. Notice that the faucet has a movement sensor. When you move your cursor near the faucet the water flows. Cool! Use the kettle and the water bottle on the faucet to fill them up with water. Hey, you never know when you'll get thirsty! Once you have both items filled, click on the toiletries to the right of the sink. You've picked up some sort of spray bottle. While it is in close up, click on it again to open it. Cool, there's a candle inside! Take the candle. Back up from the sink and turn left. This is the door with a handle, the one that leads back to the main room. Turn left. You are now facing another sliding door, this one with two doors. And it's not locked! Click on the left door to open it. On the top shelf, to the left of the towels, is an object in shadow, take it (pink ball). Back up, then click on the right door. Inside is yet another odd machine, click on it for a close up. This machine has three tubes, labeled 4, 1, and 3. Notice that you can place the balls in the tubes. If you put the balls in the tubes, take the balls back and back up. Turn right, open the door, and go back to the main room. You should be facing the open doors to the alcove. Turn left to face the TV wall. Click on the paper lantern to the left of the shelving unit for a close up. Click on the lantern screen to open it. Pull up the candle from your inventory then use the matches on it. Place the lit candle into the holder in the lantern. Close the lantern screen and lo and behold, there are now colored stars on the screen. There's a blue star in the upper left, a red star in the upper right, a green star in the lower left, and a yellow star in the lower right. Back up and turn left (or right) twice to face the wall with the pictures. Click on the right picture (the one of Mt. Fuji) for a close up. Now we just need to know the order of the corners to click. The clues are from the TV (channel 3) and the lantern. The clue from the TV was a test pattern of 7 color bars, the same colors as the stars on the lantern screen. And the test pattern had a star superimposed on it. So the pattern, from left to right, indicates which corner to click. The pattern was blue (upper left), green (lower left), green (lower left), red (upper right), green (lower left), red (upper right), and yellow (lower right). Click on the corners of the picture in the order indicated by the clues and it will slide up, revealing a coin and a stone ball. Take both and back up. Turn right to face the wooden door. Open the door and go into the bathroom. Turn left to face the sink and that door with the oddly locked doorknob. Click on the doorknob for a close up. Looks like we need a screwdriver here, but the screwdriver doesn't work. Maybe we need something thinner? Like the coin we just picked up? Use the coin on the doorknob to remove the lock. Back up once and click on the door to open it. Congratulations, you have found the toilet. Click on the doorway to enter the toilet. Click on the top of the toilet paper dispenser to open it. Hey, there's a key! Take the club key. Open the door and go back to the main room. Remember that box on the very top shelf of the shelving unit by the TV? Turn left to face the TV wall. Click on the top of the shelving unit for a close up. Use the long wooden stick in your inventory on that box on the top shelf. Cool, the box has a padlock. Maybe the club key will work on it? While the box is still in close up, use the club key on the padlock. Inside the box you will find pliers, take them. Back up, then click on those cabinet doors on the left, the ones that are wired shut. Once the doors are in close up, use the pliers to remove the wire and open the doors. Gee, another strange machine. There's a tube on top, just the right size to place the balls. Notice that there are already two balls in the machine, a clear one next to the letter A, and a blue one next to the letter B. To the left of the balls is a formula. A + B apparently equals 6. There's also an empty slot at the bottom of the machine. You can place the balls in the machine. As you do, notice that the number in the A + B equation changes. Keep cycling the balls through to get the equations. You can use these to solve the problem, which is what ball equals what number. The easiest way to do this is to find the lowest total. Gold + Blue = 3, so gold and blue are either 1 or 2. Gold + stone = 4, so gold must equal 1, and stone 3, and blue 2. Eventually you will get all of the values for the balls. Clear = 4 and pink = 5. Okay, so each differently colored ball has a different number value, so what? Where else in the room can you use the balls? Remember the other strange machine, the one inside the sliding closet in the bathroom? The numbers on that were 4, 1, and 3. Looks like we need the clear ball (4), the gold ball (1), and the stone ball (3). Shuffle the balls in the machine until you have the clear, the gold, and the stone balls in your inventory. For the colorblind: If you pull up a ball from your inventory and click on it, it will tell you what color it is. Open the wooden door and go through into the bathroom. Once inside, turn right to face the two-door closet and open the right door. Place the balls in the machine, the clear ball in the left (4), the gold ball in the middle (1) and the stone ball in the right (3). A heart shaped key will fall into the slot below, take it. You should now be facing the locked sliding door in the bathroom. Use the heart key to open the door. Click on the open doorway to go through. Now we're in another alcove. But look, yet another door! To the right of the door is a small code lock, click on it for a close up. Looks like a slot for a key card. There's a picture of a present, and it also says room number. We still have the key card for the room. Use it on the slot. Now the code lock is activated. Remember the room number? It was on the key card. Enter the room number (2514) and the little light on the right will turn green. Back up, then click on the door to escape. Follow the directions for the regular escape until you find the alcove with the exit door. Look at the code lock and note the picture of a gift. Click on the bookshelves left of the door to find yet another strange device. Click on the device for a close up. Note the picture of a gift? Notice that it also says "water" with an arrow pointing to the top of the machine. Good thing you loaded up on all that water. However, you can't pour water from the kettle in the little tube on the left. Hopefully you filled up the water bottle, though. Use the water bottle on the tube on the left and the device will fill up with water halfway. But we can't remove the water bottle! We need to get more water in the bottle, but how? We need to punch holes in the water bottle, then we can pour the water from the kettle into it. What do we have that will work? The screwdriver seems to be an ideal tool, but it doesn't work. Wait a minute, maybe it's a reversible screwdriver? Pull up the screwdriver from your inventory and click on the metallic part. Click again and it will insert back in, now as a flat head screwdriver. Use the screwdriver on the water bottle to punch some holes. Use the kettle of water on the bottle. With water all the way to the top, we get another symbol code, smiley face, Maltese cross, star of David. Remember how to solve the symbol puzzles? Average the numbers for those three symbols to get 6291. Once you get the code from the strange machine, back up. Now click on the code lock to the right of the door and place the card in the slot. Put in the code you got from the water machine and the happy coin will pop out! Take the happy coin. Now change the code to the room number (2514), back up, and click on the door. Oooh, enjoy the hot tub and the sake! I have a screwdriver, locked box, cord, remote, matches, and the keycard you start with. I have a couple of clues that don't seem to go to anything. the damn symbol puzzle. Seriously... is it just that I'm tired? Been staring at these numbers for like 20 minutes and cannot figure out what smiley face, cross, moon/star should be. some mathematical trial and error. Still wondering if I missed a big hint for it. I'm in the same spot as you, Tenzhi. I can't figure out what the clue might be for the red, blue and green hexagons which I think might be the next step. I'm bugged that the colour doesn't match on the Green Hexagon's number. Thanks for the hint, Tenzhi - I figured it out right before you posted. The TV door clue only says it's the other side of a door, and the door has a lock with a turning handle. You need another item to open it. There's something missing from those hexagons. Close observation of each one might help. Done - pretty good one, once I got past that initial puzzle. Out with the happy coin! Had less trouble getting the Happy Coin than opening the door to escape. Leave it to me to solve a puzzle easier than noticing the obvious. I probably never would have noticed the thing with the hexagons without the clue given here. Clicky numbers are so common in puzzle games that I take them for granted. I noticed that I clicked 8 times but the number 9 came up and I thought I must have miscounted my clicks! OMG... i managed to get to the room displayed on the TV, but i can't figure out the marbled puzzle inside. No matter what combination i use, its wrong.. might be a bug? Ok, well despite my "average" math, I cant get this first puzzle! face, cross, moon is haunting me! The puzzle with the three tubes? Have you found all five balls? "Average" is the key. Add together the three numbers associated with face, cross, and moon, then divide by three to get the average. I have key card, water heater with water from automatic faucet, screwdriver that i think i used once so far, lit candle, locked box, tv remote, matches, ruler i used to open door, bottle with water from automatic faucet, golden ball and pink ball. How do I know the sequence for the picture frame with the mountain? How do i cut the wire on the cupboard? where do i find more colored balls? What do i do with the stuff I have? I hope all I need is one step in the right direction, just the first thing I have to do. Remember that little lantern, between the wired shut cabinets and the tall shelving unit? Click on it, open it, and place the lit candle in the candle holder. Close the screen and you get a clue involving colored stars. The second part of that clue is on the TV, on channel 3, the colored test pattern. Once you put those together you can solve the wobbly picture puzzle. Any ideas if the camera and channel 2 on TV are significant. Seems quite elaborate to set these up if not used in the game. That was the only part I was missing. managed to get the happy coin without realizing I was solving an extra puzzle. Hey, that was amazing... finding a TV remote that HAS batteries right from the start! Wow! Is it sad that I can't play these without getting the Happy Coin, because I'm really counting on Happy Coin to bring happiness to me? I can't get beyond SWF loaded screen!!! I believe that's meant to show you why that door won't open, and is supposed to be a clue to using that iron bit to wedge the latch. I love that hexagon code. Because at one in the morning, it totally got me. Sometimes it takes a while to load. Just be patient. If it's been on the order of 10 minutes and still nothing, all I can think of is you may need to allow scripts on the page if you're using a script blocker. I'm having the same issue as linda. Stuck on "SWF loaded!!" Tried both IE and FF. Can someone PLEASE tell me where I can e-mail Tesshi-e? (and does he speak english? lol) I need to ask him where he got his wonderful background music for all his games. LOVE that stuff. and if I'm not mistaken - it's also used in the Meryl Streep/Alec Baldwin film, "It's Complicated!" - I think. Ok - about to go immerse myself in Tesshi-e's world and play this game.........no walkthrough. no walkthrough. no walkthrough. (gotta keep telling myself that). bet he bleaches it out every day. 1. For the puzzle with the balls you have to solve a system of linear equations. You might use www.wolframalpha.com for solving it. Just remember that you have five variables so you will need 5 equations. 2. Can someone tell me if this bird figurine ("Mr. Birdie") that appears in (almost?) every escape game by tesshi-e exists in reality? Is this a real decoration object that you might buy somewhere, e.g. in some asian shop, or is this just a product of tesshi-e's fantasy? Because I would love to have such a thing, especially if it were made of glass, too. In exactly the same boat as Linda and DAM. Have tried loading it in IE, Firefox, Chrome, Opera and Safari but no joy. All advert/script blockers turned off but still get "SWF loaded!!" and nowt else! I didn't use any of that math for the colored balls puzzle. At first I was going to - then I realized that by just getting all the data first and writing it all down - I could then sort of "sense" it out. For example, using the letters: G, S, C, B & P for gold, stone, clear, blue and pink ball respectively - I just wrote down all the results in a vertical list: G+P=6;S+G=4;C+S=7:G+B=3. Then I looked at the lowest numbered equation: G+B=3 - and I knew that one had to be 1 and the other had to be a two. From there I just pieced it out: If G=1 - do the other equations make sense - and if B=1 do the other equations make sense. It worked with G=1 and from there you can work out all the rest. It probably would've been better using the right equation from scratch - but I didn't know it. Sorry for this long post - I didn't realize it would take so many words to describe the simple process I used for this puzzle. Oh - and wolfram's site is GREAT - I bought the guy's book on complexity a few years back - he's apparently a mathematical genius and prodigy from his early childhood. use inequalities. Assuming none of the balls are zero and all have different values, just by looking at the equations you got from the addition machine, two balls must be less than 3, one must be less than 4, one must be less than 5, and one must be less than 6. Starting at the top, the one less than 6 must be 5 (because there's 5 balls with different values and no other ball can be 5), the one less than 5 must be 4, and so on, eventually leaving you with only one choice -- which ball to assign 2, and which to assign 1, but even this is trivial to find out by simple substitution. the ruler at the door (at least the card should be able to do this too), and the door that had to be unlocked with a coin (we already had a perfectly fine screwdriver with an exchangable head at that point, and even the ruler or card should've been able to do the job). Yeah yeah, adventure game logic and all, but it would've been better if Tesshi-E had come up with some vaguely plausible reason why the alternate objects couldn't be used (too thick, or too fragile, or too risky (don't want to risk breaking the card and get stuck), etc). On an unrelated note, it'd be nice if this comment submission thing had a link to renew the captcha. Sometimes I spend too much time writing a comment and it times out, and occasionally it even thinks I'm a robot, the silly thing. I'm like totally a real unicorn. can someone please tell me how to get the game to load I used to be able to play my favorite tesh games but now the load bar moves across and then it just says swf loaded please help its either escape games or prozac thanks friends! If you search the terms "drinking bird toy" or "dippy bird," I'm sure you'll find tons of links to satisfy your cravings!